RAC Appeals: Should You Bother? Experts weigh in on low appeal numbers and possible solutions to make the process run smoother. The numbers may surprise you. According to recent RACTrac data, hospitals appeal only 42% of all Medicare claims denied by a recovery audit contractor (RAC). Of these, 72% are overturned, netting organizations a total of $104.9 million in recouped funds. Is the RACTrac data about hospital disinterest in appeals accurate? If the success rate is relatively high, then why aren’t more organizations taking advantage of the appeals process? Would the ability to submit appeals electronically result in more filings? Most importantly, what can hospitals do to ensure valuable dollars aren’t slipping through the cracks? RACTrac statistics don’t tell the entire story, according to Jeffrey Horner, director of product management and implementation at MRO Corp. If a provider doesn’t follow proper coding and/or documentation procedures initially, then it probably has no argument on which to base an appeal. Thus, it wouldn’t invest the time and resources to do so, he says. Why else could the numbers be low? RAC responses to appeals also are disheartening, according to Ronald Hirsch, MD, FACP, vice president at Accretive Health. “I think there’s an overall frustration that the reviewers never read the appeal letters that are sent in,” he says. Hirsch says some hospitals don’t appeal because they buy into the myth that doing so could make them subject to more audits. “I think some hospitals had the impression that if they appeal, they’re going to make themselves targets for more denials. They didn’t want to be under the eye of the OIG [Office of Inspector General] or any [other auditor]. They’d rather slide under the radar, take the penalty, and hope that things don’t get worse,” he says. Then there’s the issue of cost. Sixty-three percent of all hospitals reported spending more than $10,000 managing the RAC process during the third quarter of 2012, according to RACTrac. Forty-three percent spent more than $25,000, and 13% spent more than $100,000. “This is a very expensive proposition if you’re going to do it correctly,” Hegland says. What could be a real game changer in terms of appeal volume is the CMS’ electronic submission of medical documentation (esMD) system, which allows providers to respond to documentation requests electronically via PDF files. Phase 1 of the project will eventually include the ability to submit appeals electronically, according to the CMS website. Between September 15, 2011, and September 15, 2012, 1,778 providers sent one or more documentation requests electronically to a review contractor via the esMD gateway. Providers either can build their own gateway or work with one of 17 certified health information handlers to submit documentation electronically. Any EHR system capable of exporting health information as a PDF file can be submitted via an esMD gateway. Quicker turnaround times are another benefit. RACs currently accept appeals via paper or disc. “Right now, if providers are mailing in that documentation, the reviewer has to scan in and index that documentation before the review can take place. [With electronic submission of appeals], they can respond to the appeals and get decisions out to providers in a more expedited manner,” Smith says. The CMS reports that the payment turnaround for providers using esMD is six days as opposed to three weeks using a paper process. “I think all of this is progress, but the efficiencies are still going to be minimal,” says Crump, who adds that the time-consuming part of appealing denials is reviewing the letter, crafting the appeal, and sending the appropriate documentation. Appeals still will largely depend on whether providers have the resources to devote to that process, Horner says. “While the electronic submission is a bonus, I can’t imagine that it’s drastically going to change the number of appeals that comes out of every hospital,” he notes. “I think it’s going to make the submission easier, but I don’t think it’s going to make the process any faster,” says Lori Brocato, HealthPort’s revenue cycle management product manager. Benton says providers also should be aware of a few challenges associated with esMD. “If the handler does not monitor the CMS gateway for outages or parse files into smaller sizes to avoid the 19-MB restriction on medical records, providers will have to manage those tasks themselves to ensure successful delivery through the gateway,” she says. Despite these challenges, experts say a gateway is the first step to improving communication between providers and reviewers. Phase 2 of esMD features bidirectional electronic communication between reviewers and providers, including documentation requests, demand letters, and result notices. The electronic review of result notices will be particularly helpful. According to RACTrac, nearly 50% of hospitals cite “not receiving a demand letter informing the hospital of a RAC denial” as a process issue. Crump says electronic communication hopefully will pave the way for providers to be able to access online this and other important dates, such as the date that documents are received or the date a decision is made, for tracking purposes. This tracking ability potentially could assist with Part B rebilling because hospitals must withdraw appeals before they can rebill, Hirsch says. “It would be great to have something electronic where a hospital could push a button and say they want to withdraw [an appeal], it gets automatically recorded, and they can resubmit a Part B bill,” he adds. Having dedicated staff members whose responsibilities relate only to audits and appeals makes a big difference because it allows those individuals to excel at what they do and see the bigger picture in terms of trends across auditors, Hegland adds. Not only do audit team members track their time for each step in the process, but they also review records before they go out the door. This ensures that information is readable and that admission orders, the history and physical, and other important elements are present. This approach seems to be paying off. Hegland says the health system hasn’t lost a single dollar because it failed to meet a deadline or didn’t follow the rules. Its average of “no findings” has been 81% overall, with a 15% overpayment rate, and it’s appealing close to 90% of the overpayments and winning nearly all of them at levels 1 and 2. If there is no appeal, the staff collects data regarding why and performs follow-up education with physicians or coders, as necessary, to prevent those errors from occurring in the future. Developing internal appeal guidelines also is helpful, Crump says. “There should be some guidelines about what you’re going to appeal and when,” she notes. “It may not be worth it to take a $2,000 case up through the ALJ.” Hospitals increasingly are setting appeal goals based on their volume of denials, she adds. Finally, Brocato says providers must learn to overcome any excuses they have for not appealing. “As long as CMS continues to see lower appeal rates, they’re just going to continue to do RACs and these other types of reviews, thinking that they’re not going to have to pay that money back to the provider,” she says. Most hospitals have seen an increase in denials since the RAC program began. 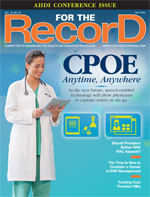 Surprisingly, the CMS announced in April that it actually would lower the minimum number of records that RACs can request, from 35 to 20 every 45 days for providers whose calculated limit is 19 additional documentation requests or fewer. In addition, the agency placed a 75% limit on any particular claim type that a RAC may review. Both of these changes seem to suggest a reprieve for both RACs and providers. It’s not uncommon to contact a reviewer to check for a status update regarding an appeal only to be told that “they don’t have enough staff and for us to quit calling, basically,” Crump says. However, this recent change affects only the minimum number of records, and it may only be temporary. “There has been a lot of talk that they would raise the limits again,” Hegland says. In the interim, there may be a shift in the types of claims that hospitals appeal, Crump says. For example, if a hospital begins to receive more requests—and denials—for inpatient rehabilitation claims because of the 75% cap on acute hospital inpatient claims, its rate of rehab claim denials could increase. Experts say there are other regulatory changes on the horizon that may affect appeals in a more significant way. For example, the CMS’ newly announced administrator’s ruling about Part B rebilling actually may lower appeal volumes because hospitals will have the option to rebill rather than appeal. The ruling, published March 13, allows full Part B payment for inpatient stays that a contractor denies because it deems them to be unreasonable and unnecessary. To be eligible for such payment, hospitals must submit a Part B inpatient claim for reasonable and necessary services that would have been payable had the beneficiary originally been treated as an outpatient rather than an inpatient. The ruling serves as interim guidance until the agency finalizes a proposed rule on the topic. The proposed rule limits some policies of the interim ruling, such as the exception from timely filing. However, it also expands the rebilling policy to include provider self-audits. “I think you will probably see a drop of appeals, but I don’t think it will go away,” Crump says. Some providers will just accept the Part B payment for most denials and appeal only the high-dollar ones and move on, she adds. — Lisa A. Eramo is a freelance writer and editor in Cranston, Rhode Island, who specializes in HIM, medical coding, and health care regulatory topics.